The WheelDoctor is the first and only TÜV-certified machine for professional alloy wheel refurbishment to date. 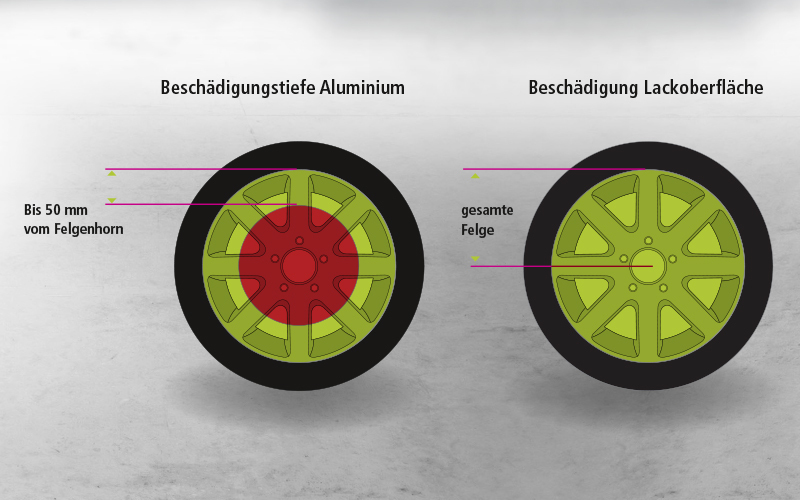 Since wheels are absolute safety components, certain regulations must be observed for alloy wheel refurbishment. For example, removal of damages is only allowed up to a depth of one millimetre in the base metal which are no further away from the outer flange than 50 mm. Scratches on the painted surface can be repaired in the whole visible area of the wheel. With the WheelDoctor, this can be done easily and safely by the rotation grinding process. Because the WheelDoctor process satisfies all the conditions of the "Description for visual wheel refurbishment of 5/11/2010" of the special "Wheels and Tyres" committee of the Motor Vehicle Technical Committee (FKT). In addition, the TÜV-Süd tested the safety of our alloy wheel refurbishment in an intensive test procedure. Their technical report of 07/08/2008 on the impact of damage and refurbishment on the structural durability of alloy wheels report no. 76232807-1, confirms that if users comply with our WheelDoctor catalogue of limit values for damage, the structural durability of wheels refurbished using our WheelDoctor process will not be compromised.